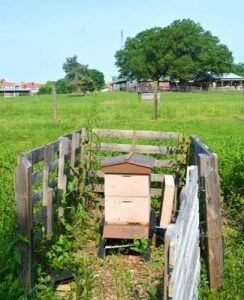 This year a group of students at NC State’s College of Veterinary Medicine (CVM) have been busy as bees establishing a habitat for bees and a community garden on campus. Just after spring semester classes wrapped up, a handful of volunteers put the finishing touches on the new garden located between the Terry Companion Animal Veterinary Medical Center and the college’s library. “The CVM Community Garden is a way to educate and unite the CVM community to promote human, animal and environmental health,” said vet student Lauren Brierley. Brierley is part of the CVM Students for One Health group that led the garden and apiary effort, which received a $7,000 grant from the NC State Sustainability Fund. The grant, plus additional funding from the college, provided a new apiary for bees — vital pollinators for food supply — as well as the educational garden. The garden was incorporated into an existing landscape with help from the University Architect and NC State’s Design and Construction Services. Featuring an assortment of pollinator-friendly and native plants, the garden is an educational space for future vets to learn about medicinal plants as well common plants that are toxic to mammals. 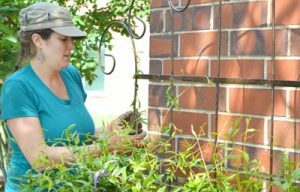 “Each plant [in the garden] was intentionally chosen,” said vet student and garden project leader Andeliene Croce. In addition to a variety of plants and signage to identify the species, the garden features a rainwater cistern that will collect water for the garden’s irrigation needs. Plus, several large planters have been incorporated into the garden design and are available for adoption by individuals or organizations. “A club [that adopts a planter] might choose to grow fresh produce for the [turtles being rehabbed by the college’s] Turtle Rescue Team or specific plants to use for animal enrichment,” Croce said. The garden and apiary are the latest in a string of projects led by the CVM Students for One Health club. The One Health concept, which focuses on the interconnectedness of humans, animals and the natural world, has been the driving force for this student club advocating for a more sustainable vet school and campus. “Dean Lunn, Assistant Dean Flammer, and other CVM administration have been 100 percent supportive of this student effort the whole way. We could not have done it without their help,” Brierley said. Among the students’ successful projects are a water conservation audit of the vet school main building and the development of a satellite recreation room for vet students, who are often too busy to travel to the university’s main recreation facilities. “We’re trying to be a One Health community — from advancing our student health with the gym to increasing environmental health with the garden and apiary,” Croce said.